My mother made these treats for us every year at Christmas. 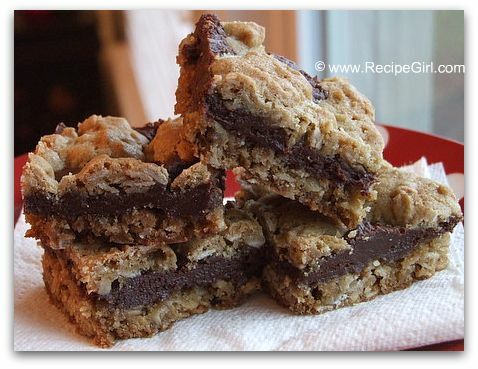 They’re like an oatmeal cookie bar with a gooey chocolate layer. It’s one of those recipes that our family still makes every year during the holidays, even though it’s not at all a holiday cookie. I guess sometimes traditions just stick. They’re seriously a big-time favorite of my brother and my chef nephew. There’s something about them that are really addicting and of course, delicious. I personally hated them growing up. 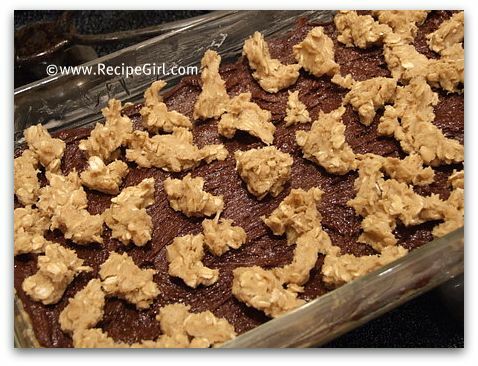 Mom added walnuts, and as a kid I disliked all baked goods with nuts (still do, really). 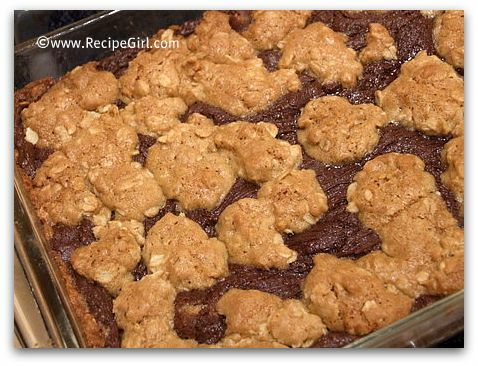 Now I make these without the nuts and have become quite fond of them too: Fudge- Nut Layer Bars (minus the nuts). 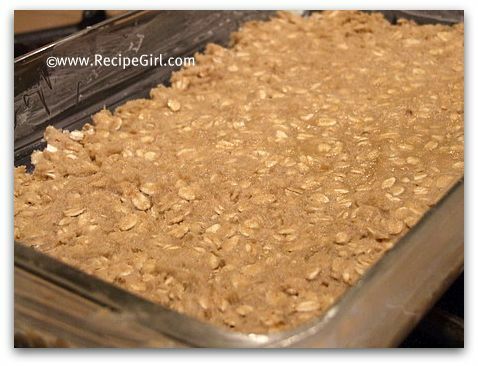 An oatmeal-cookie dough layer is spread into a 9×13 pan. 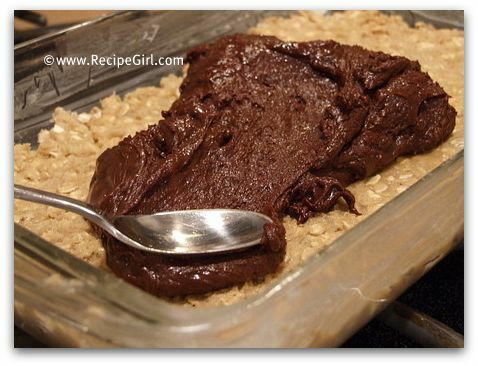 A wonderful melted chocolate layer is spread onto the oatmeal layer. It’s basically chocolate chips, sweetened condensed milk, vanilla & salt. You’ll be tempted to eat it by the spoonful, I promise. Dollops of additional cookie dough are disbursed on top. Here’s the baked product- not terribly attractive, is it? Don’t let this sway you. It’s good stuff. Let them cool, and then cut them into bars. See those fudgy layers in there? That’s what makes this recipe so good. That fudge layer is amazing. You can certainly add nuts if you’re into that. I’m not sure where exactly this recipe originated. My mother was always fond of those little Pillsbury Bake-Off winner booklets, so it very well could have been one of those. 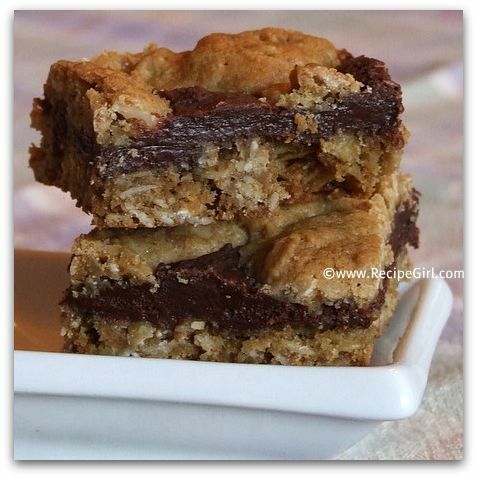 In any case, this recipe is definitely a winner… a tried and true RecipeGirl family favorite. This certainly does look appealing! I would like 3 please! Ooohh, I can see why you bring this one back from your childhood! Now these I love. Love that last shot!